An important characteristic of a screening tool is its discriminant ability or the measure’s accuracy to distinguish between those with and without mental health problems. The current study examined the inter-rater agreement and screening concordance of the parent and teacher versions of SDQ at scale, subscale and item-levels, with the view of identifying the items that have the most informant discrepancies; and determining whether the concordance between parent and teacher reports on some items has the potential to influence decision making. Cross-sectional data from parent and teacher reports of the mental health functioning of a community sample of 299 students with and without disabilities from 75 different primary schools in Perth, Western Australia were analysed. The study found that: a) Intraclass correlations between parent and teacher ratings of children’s mental health using the SDQ at person level was fair on individual child level; b) The SDQ only demonstrated clinical utility when there was agreement between teacher and parent reports using the possible or 90% dichotomisation system; and c) Three individual items had positive likelihood ratio scores indicating clinical utility. Of note was the finding that the negative likelihood ratio or likelihood of disregarding the absence of a condition when both parents and teachers rate the item as absent was not significant. Taken together, these findings suggest that the SDQ is not optimised for use in community samples and that further psychometric evaluation of the SDQ in this context is clearly warranted. Lifetime prevalence and age-of-onset distributions of DSM-IV disorders in the National Comorbidity Survey Replication. Little is known about lifetime prevalence or age of onset of DSM-IV disorders. To estimate lifetime prevalence and age-of-onset distributions of DSM-IV disorders in the recently completed National Comorbidity Survey Replication. Nationally representative face-to-face household survey conducted between February 2001 and April 2003 using the fully structured World Health Organization World Mental Health Survey version of the Composite International Diagnostic Interview. Nine thousand two hundred eighty-two English-speaking respondents aged 18 years and older. Lifetime DSM-IV anxiety, mood, impulse-control, and substance use disorders. Lifetime prevalence estimates are as follows: anxiety disorders, 28.8%; mood disorders, 20.8%; impulse-control disorders, 24.8%; substance use disorders, 14.6%; any disorder, 46.4%. Median age of onset is much earlier for anxiety (11 years) and impulse-control (11 years) disorders than for substance use (20 years) and mood (30 years) disorders. Half of all lifetime cases start by age 14 years and three fourths by age 24 years. Later onsets are mostly of comorbid conditions, with estimated lifetime risk of any disorder at age 75 years (50.8%) only slightly higher than observed lifetime prevalence (46.4%). Lifetime prevalence estimates are higher in recent cohorts than in earlier cohorts and have fairly stable intercohort differences across the life course that vary in substantively plausible ways among sociodemographic subgroups. About half of Americans will meet the criteria for a DSM-IV disorder sometime in their life, with first onset usually in childhood or adolescence. Interventions aimed at prevention or early treatment need to focus on youth. Conceived and designed the experiments: SV TF. Performed the experiments: SV. Analyzed the data: SV RP RC. Contributed reagents/materials/analysis tools: SV. Wrote the paper: SV RC MB RP AJ MC TF MF. Critically reviewed the manuscript and provided expert feedback: AJ. This project was funded by a Doctoral scholarship provided by the Centre for Research into Disability and Society and the School of Occupational Therapy and Social Work, Curtin University, Perth, Australia. It was part of a larger study that was awarded the 2007 Social Determinants for Health Research award by Healthway Australia. The funders had no role in study design, data collection and analysis, decision to publish, or preparation of the manuscript. Data Availability All relevant data are within the paper. 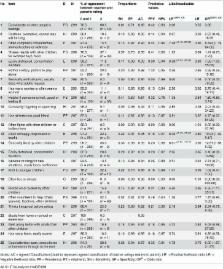 The mini-mental adjustment to cancer scale: re-analysis of its psychometric properties in a sample of 160 mixed cancer patients. Perinatal complications, lipid peroxidation, and mental health problems in a large community pediatric sample. Integrating complementary therapies into community mental health practice: an exploration.